A complete and harmonious hotel located is the best for describing Adhi Jaya Hotel. Located in the center of prestigious Kuta area, this hotel is only 5 minute walk from the famous Kuta Beach. You do not need to wait for too long to enjoy the hospitality of this hotel since it is only 20 minutes from Ngurah Rai International Airport. Also enjoy the nearby attractions which are just a few steps away from this hotel such as Waterboom Bali, Discovery Shopping Mall, or other entertainment centers. If you want to visit some places on the capital city of this island, like Puputan Badung Square, Bali Museum, and so forth, you will only need 20 minute driving. 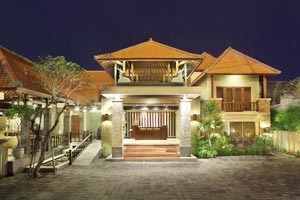 Adhi Jaya Hotel offers 75 guest rooms which are nicely decorated to give you the most comfortable experience in Bali. The combination of modern, contemporary interiors with the traditional accents of Bali makes every rooms has its own unique atmosphere. These rooms are arranged well to give the guests the best view over the public pool, the exotic frangipani trees, and green gardens. All rooms are completed with modern amenities like plasma TV with international channels, minibar, and hot and cold showers. Guests can relax themselves in the public pool or enjoy the sensation of spa at the Kayan Spa. Try to rejuvenate your body and soul state by enjoying the packages of Luxurious Royal Crystal Facial, tension relief, Balinese massage, reflexology, and Kayan Signature Massage. We have stayed here on many occasions over the last few years and always enjoy our time here. Our most recent trip was March 2012 as usual we requested one of the garden villas at the back as it is peaceful with a veranda to sit and enjoy a drink or read. The pool area is lovely with plenty of beds a swim up bar and some greenery however not a tropical garden like many hotels. The rooms have recently been renovated, they also have 2 story 2 bed apartments for families or groups. The hotel has a restaurant where they serve a decent breakfast it also fronts on to the street right opposite Centro so a great location. Given this location once you enter the hotel it is hard to believe how busy it is outside as you ge none of the noise in the hotel. The staff are very helpful & friendly and always ready with a smile or for a chat. Overall we will stay bees again on one of our next visits. Room Tip : We prefer a garden room at the back away from the pool.